show your l♥ve for #thehopmke by posting your pics from the event! New things are being added to the weekend’s plans, so check back frequently! All events are free and open to the public, just like The Hop! Rides are free for the first year thanks to Potawatomi Hotel & Casino. 11 a.m. Music’s up in the park with DJ Kima Hamilton of 88Nine Radio Milwaukee. Noon It’s go time! Mayor Tom Barrett, U.S. Congresswoman Gwen Moore, Federal Transit Administration officials, Common Council members, and Potawatomi Hotel & Casino CEO Rodney Ferguson commemorate Milwaukee’s new streetcar! 1 p.m. Service begins! Hop on! There’ll be 2 vehicles at Cathedral Square, 1 at Burns Commons, and 1 vehicle at the Intermodal stop at the corner of Vel R. Phillips Ave. and St. Paul Ave.
12:45 p.m.-2 p.m. Stop by The Hop tent to pick up some fun freebies and to purchase a T-shirt! Then enjoy the sounds of DJ Kima Hamilton. Noon-2 p.m. Ride The Hop to Burns Commons for “Milwaukee in Motion”— a Multi-Modal Transportation Fair featuring Milwaukee’s various forms of transportation, from planes to trains to bikes! Grab some FREE Colectivo coffee and hop, hop, hop while Dori Zori from Radio Milwaukee spins some tunes. Streetcar service from 7 a.m. to 10 p.m. There will be happy hopping for kids of all ages with a variety of family-friendly activities at stations along the streetcar route. Times are 10 a.m.-2 p.m. unless noted. Milwaukee Fire Department: Meet the men and women of the Milwaukee Fire Department; experience the Survive Alive House, view firefighting equipment; meet the mascot Sparky; sign up to have a smoke detector installed in your home (City of Milwaukee residents only); and more. MOBILE SURVIVE-ALIVE HOUSE WILL BE ON SITE. Visit Milwaukee/Mandel Group: Find the “Me in MKE” statue, take a photo and share how you do Milwaukee. Be sure to tag #MeInMKE! NO CHANGE. Milwaukee Jewish Museum: Free admission from noon to 4 p.m. to this museum which is dedicated to preserving and presenting the history of the Jewish people in southeastern Wisconsin and celebrating the continuum of Jewish heritage and culture. NO CHANGE. Artists Working in Education Truck Studio: Drop by for art-based enrichment activities for youth ages 4 – 14. RELOCATED TO 2ND FLOOR OF MILWAUKEE PUBLIC MARKET. USE HISTORIC THIRD WARD STATIONS. 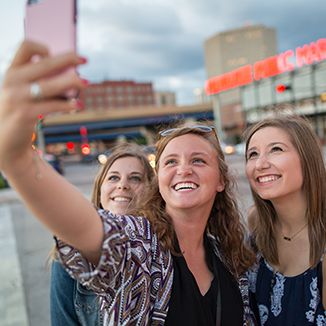 Milwaukee Downtown: Play giant and regular-sized versions of your favorite board games such as Connect 4, lawn Yahtzee, corn hole, Chess, Clue, Jenga and many more at the Downtown GO! Kart. POSTPONED. The Hop Tent: Visit The Hop info tent for free tote bags (kids only) and streetcar stickers (while supplies last) and T-shirt sales. INSTEAD, LOOK FOR HOP VOLUNTEERS ON-BOARD STREETCARS WITH GIVEAWAYS FOR KIDS. MSOE’s Grohmann Museum: Free admission from 1-4 p.m. to this home of the world’s most comprehensive art collection, dedicated to the evolution of human work. (Museum is one block north on Broadway and State.) NO CHANGE. The staff of OnMilwaukee, an online lifestyle and entertainment magazine and digital media company, will provide free temporary tattoos that celebrate numerous Milwaukee icons. POSTPONED. Hop off at the Milwaukee Public Market to find a face painter and mascots from the Bucks (10:30-11 a.m.), Brewers (12:15-1:15 p.m.) and Admirals (1-1:45 p.m.). MOVED INDOORS TO 2ND FLOOR. Milwaukee Police Department: Visit the members of the Milwaukee Police Department, including the horse patrol. 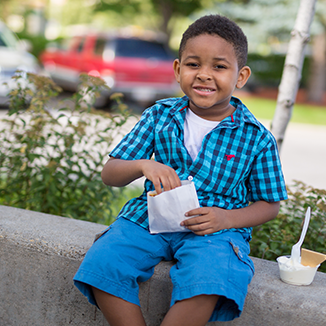 Enjoy free ice cream treats courtesy of Pick ‘n Save and Kemps and other giveaways (while supplies last). ICE CREAM TRUCK MAY RELOCATE TO INTERMODAL STATION ON VEL R. PHILLIPS AVE, UNDER COVER OF THE FREEWAY. Please DON’T HOG THE HOP! Other streetcar cities have seen big crowds on opening weekend. Please be prepared to wait to board a streetcar vehicle and please do not expect to ride the streetcar’s entire route continuously. Plan to exit at stops along the way to explore restaurants, shopping and downtown activities. To accommodate those who have enjoyed a streetcar ride and want to return to their original location without waiting in line for The Hop, the city will offer free bus service along the route as needed. Look for buses with “Bus Bridge” signs. Vehicles will generally arrive every 15 minutes, however during periods of heavy traffic or increased ridership the wait times may be slightly longer. Thanks to these streetcar project development partners! Kiewit is one of North America’s largest and most respected construction and engineering organizations. With roots dating back to 1884, the employee-owned organization operates through a network of subsidiaries, including Mass Electric Construction Co., in the United States, Canada and Mexico. Kiewit had 2017 revenues of $8.7 billion and employs more than 22,000 staff and craft employees across all of its operations. In Milwaukee, we are proud to have been an integral part of The Hop team, with Kiewit Infrastructure Co. serving as the Construction Manager/General Contractor and Mass Electric as a systems contractor on the project. 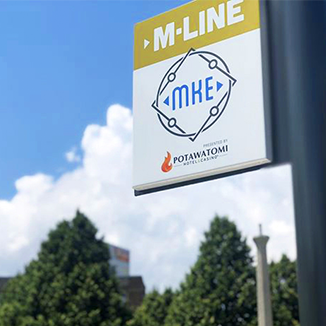 We look forward to the success of The Hop, congratulate the City of Milwaukee on its new streetcar system, and are excited to see its positive impact on the community for years to come. HNTB Corporation is an employee-owned infrastructure firm serving public and private clients. Celebrating a century of service, HNTB understands the life cycle of infrastructure and addresses clients’ most complex technical, financial and operational challenges. Professionals nationwide deliver a full range of infrastructure-related services, including award-winning planning, design, program management and construction management. HNTB is proud to provide planning, environmental and design services for The Hop and serve as a trusted advisor to the City of Milwaukee on this transformational project that will contribute to a vibrant local economy and improve mobility in the community for years to come. Transdev operates public transportation in thousands of cities in 20 countries, providing over 11 million passenger trips every day. We are very proud to be the operator of the streetcar in Milwaukee. We look forward to helping the City of Milwaukee achieve its vision for mobility, enhanced economic development and an even more vibrant downtown through its new streetcar. We are the world's largest operator of streetcar and light rail systems, operating in Barcelona, Hong Kong, Sydney, Dublin, New Orleans and many other cities.